Highlights include impressive new rivals to Shadowplay and FRAPS. There’s a chill in the air, and the leaves are falling off the trees en masse. 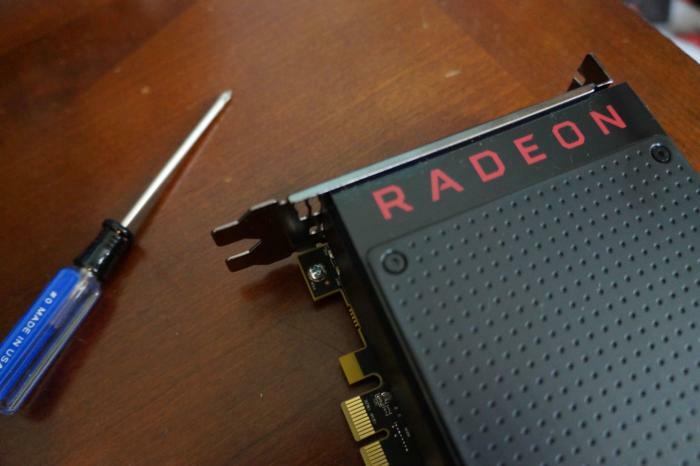 You know what that means: It’s time for AMD’s huge annual Radeon software update. 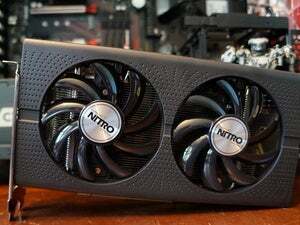 Like 2014’s Catalyst Omega and 2015’s Radeon Software Crimson, this year’s refresh packs in some huge new features and extends some existing ones—like the superb Radeon WattMan overclocking tool—to more graphics cards. This year’s iteration expands on Radeon Crimson to become Radeon Software Crimson ReLive Edition (whew, what a mouthful), named after its highlight ReLive feature. 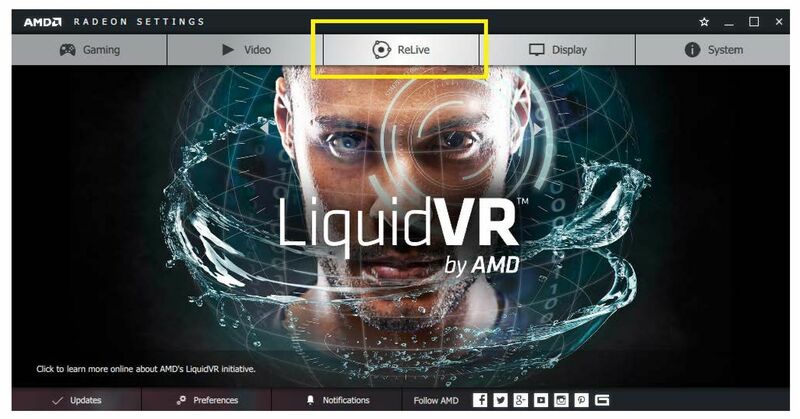 ReLive replaces the Raptr-powered AMD Gaming Evolved app that AMD unceremoniously dumped a few months back. It brings a bevy of video recording and streaming options right into AMD’s core software to challenge Nvidia’s popular Share (née Shadowplay) solution. But that’s just the tip of the iceberg. There’s all sorts of new gamer-centric tools, including FreeSync improvements, HDR support, and a feature designed to ratchet down Radeon temperatures and power usage when extra oomph isn’t needed. Separately, AMD’s releasing an easy-to-use benchmarking tool that logs in-game performance across DirectX 11, DX12, and even Vulkan games. There's a lot, is what I'm saying. Let’s dig in. It only seems appropriate to start with ReLive. ReLive does everything you’d expect a utility like this to do: video recording, video streaming, instant replays, and screenshot captures. The new ReLive tab in Radeon Settings. Open the Radeon Settings tool and you’ll find a new ReLive tab in the navigation buttons across the top. Selecting it reveals a wealth of options, from simply enabling ReLive—it’s disabled by default—to setting hotkeys, assigning where your gameplay videos will be saved, and deciding whether to record just games or your PC’s desktop as well. Instant replay. Saves the last few minutes of your gameplay. You can configure how far back Instant Replay saves in the Radeon Settings tool’s ReLive options, along with granular features like the encoding type and frame rate for recordings. Record video. As with instant replay, the ReLive settings (pictured above) let you tweak the details, such as video and audio bitrates and the recording resolution. The video encoding options available to you depend on which graphics card you’re using. And yes, you can opt to record the desktop too. Huzzah! Stream to Twitch, YouTube, or other services. Again, you can tweak all sorts of options related to the output. Video capture utilities are great—unless they send your in-game frame rates plummeting, in which case they’re garbage. Fortunately, Radeon ReLive appears to fall into the former category. When AMD tested Overwatch, H1Z1 King of the Kill, Battlefield 1, and World of Warcraft—examples of games that are widely streamed—at punishing graphics levels on a system equipped with a Core i7-600K and Radeon RX 480, ReLive’s impact was a mere 3 to 4 percent loss. Always take manufacturer-supplied numbers with a pinch of salt, but that’s impressive. Time will tell whether Radeon ReLive winds up being as popular as Nvidia’s vaunted ShadowPlay, but it’s certainly off on the right foot. AMD’s new Polaris GPU architecture succeeded in driving the energy and heat levels of graphics cards way, way down in the Radeon RX 400-series versus their predecessors, but Nvidia’s new GeForce GTX 10-series graphics cards still hold the energy-efficiency crown. The new Radeon Chill feature in Crimson ReLive aims to cool down AMD’s hardware with an assist from software, sort of like a more effective version of AMD’s existing Frame Rate Target Control. 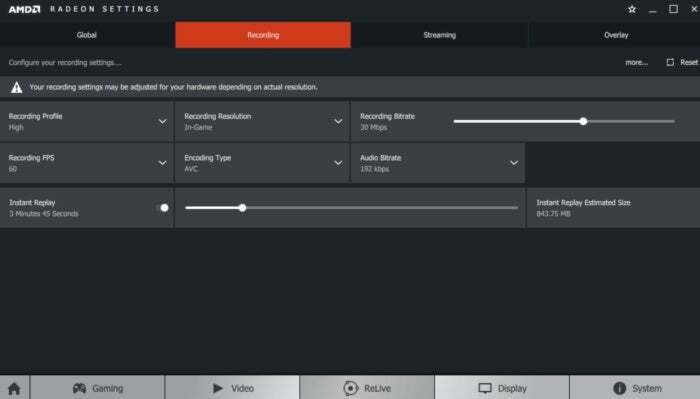 Radeon Chill—which, like the ReLive feature, is disabled by default and must be enabled in the WattMan section of the Radeon Settings app—aims to scale down your graphics card’s GPU usage rather than pump out unneeded extra frames. The feature tracks your computer’s input. When your mouse and keyboard go idle for a few seconds, Chill dynamically scales down the frame rate because the on-screen action is static. When you start moving again, the frame rate fluidly ramps back up. Meanwhile, Chill’s constantly working to avoid excessively high frame rates to reduce the load on your GPU. AMD says that using Radeon Chill in World of Warcraft results in up to 31 percent power savings and a temperature decrease of up to 13 degrees Celsius, while fan noise is also notably decreased. Like Nvidia’s Fast Sync, the biggest benefits come in less-intensive games that routinely pump out frames far faster than a system’s monitor can display them—think e-sports titles—though you’ll also see a difference in traditional titles, too. 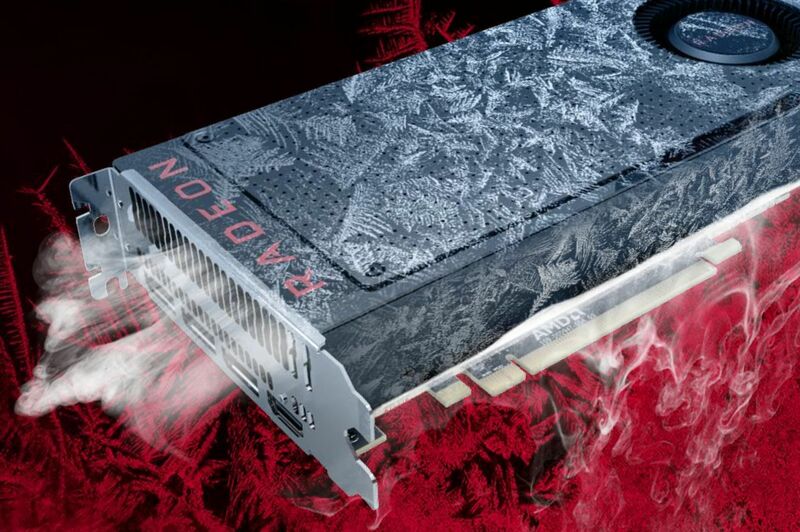 Radeon software head Terry Makedon says that in “blind taste tests” users don’t see any difference in performance when using Chill, because it was designed to ramp up and scale down frame rates quickly. And if you do see the transition, you can dive into the Radeon Settings profile for specific games and fine-tune how Chill behaves, manually tweaking the minimum and maximum frames per second. The games supported by Radeon Chill at launch. 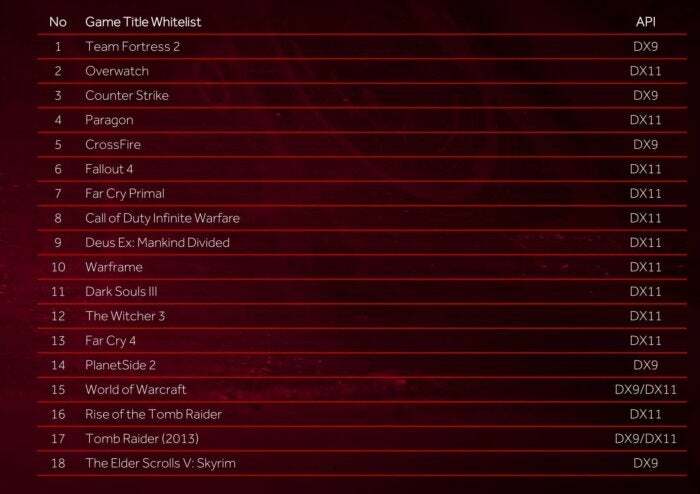 AMD’s rolling out game support for Radeon Chill using a whitelisting method, which means the company approves specific games and creates profiles for them. Over time, AMD hopes it can move to a blacklisting method instead, Makedon says—disabling Radeon Chill only in games where it doesn’t function properly. DirectX 9, 10, and 11 games can be supported by Chill at launch.